A moderately strong earthquake struck Canterbury this morning, the seventh largest aftershock of the Darfield earthquake. A magnitude 5.1 earthquake roused Cantabrians from their beds at 6:03 this morning. GeoNet reports that the earthquake, an aftershock in the Darfield earthquake sequence, was located 10 km south-west of Christchurch at a depth of 10 km. The earthquake is the seventh largest aftershock resulting from the Darfield earthquake of September 4th 2010, equal in size to aftershocks which struck on September 4th and 5th last year. Light damage has been reported. Initial analysis by GeoNet shows that the strongest ground shaking was measured at Lincoln, where this morning’s earthquake was measured at 0.14g. This Peak Ground Acceleration (PGA) measurement shows how strongly the earth shook at a particular location according to readings taken by instruments. When expressed in terms of g (gravities) it effectively shows the lurch or jolt that was experienced on the ground at the time, much the same as if someone was given a violent shove. By comparison, Lincoln experienced a PGA of 0.91g as a result of the main Darfield earthquake. This morning’s earthquake was less strongly felt in Christchurch city, where the magnitude 4.9 aftershock of December 26th caused much more damage. 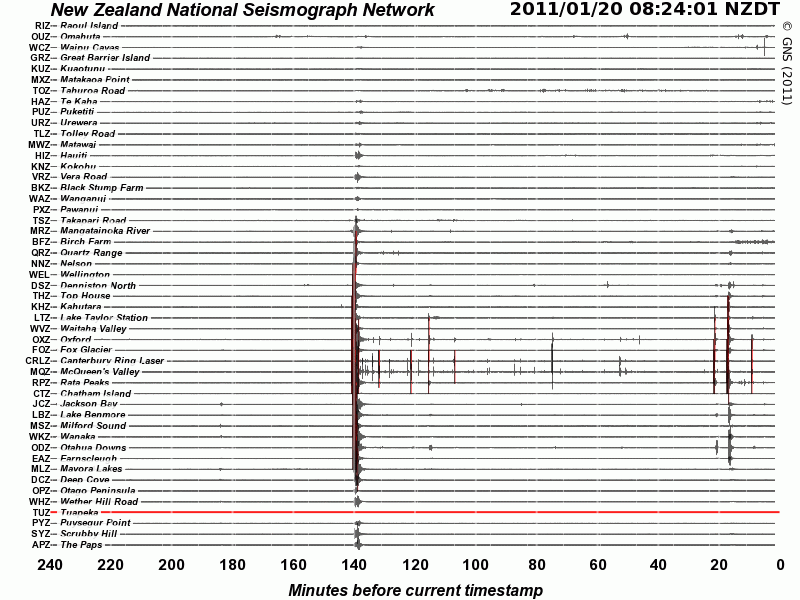 The Boxing Day quake was closer to the city and, at 12 km, of a similar depth to today’s event. Proximity to a shallow earthquake is an important factor in determining how much shaking will be felt. For example the Peak Ground Acceleration in the Christchurch Botanic Gardens resulting from the Boxing Day earthquake was 0.48g, much stronger than the 0.18g which resulted from the magnitude 7.1 main event of September 4th which was centred 40 km west of the city. This morning’s aftershock was measured at 0.02g at the gardens. However, it should be noted that ground acceleration is only one component of the earthquake experience, and the sheer size of the main earthquake produced sustained shaking over a long period of time and hence caused serious damage over a wide area. The Canterbury Quake Live website, operated by Chris Crowe, reports that this morning’s aftershock was located near Hay’s Road in Halswell, 11.7 km away from The Square in Christchurch. The Boxing Day aftershock was located near Huxley Street in Sydenham, only 2.6 km from The Square. Earthquake activity in Canterbury has increased as a result of this morning’s aftershock with a further four events reported by GeoNet. A magnitude 3.2 quake struck at 6:28 a.m., and two quakes of magnitude 3.4 and 4.0 struck four minutes apart at 8:02 and 8:06 a.m. A magnitude 3.2 earthquake struck at 8:14 a.m. This entry was posted on Thursday, January 20th, 2011 at 10:38 am and is filed under Earthquakes - Analysis. You can follow any responses to this entry through the RSS 2.0 feed. You can skip to the end and leave a response. Pinging is currently not allowed.